The Stars: A New Way to See Them by H. A. Rey. This is an excellent guide for learning the constellations, with some very basic introductory astronomy material. It was written by the cartoonist who created "Curious George". It's a serious astronomy book, but at the same time it keeps you entertained with its cartoony style. Find The Constellations by H. A. Rey is the same book, but for youngsters. This book got me started in astronomy when I was in second grade. If you want to purchase a telescope, it's an excellent idea to do your homework up front. Star Ware: The Amateur Astronomer's Guide to Choosing, Buying, and Using Telescopes and Accessories by Philip S. Harrington is a wonderful guide to astronomy hardware. It stays breezy and never lets you get lost in technobabble. It also contains a quiz that you can fill out and will recommend the type of telescope that's best for you. The Backyard Astronomer's Guide by Terence Dickinson and Alan Dyer is another good first book to learn about telescopes and astronomical hardware. Astronomy Hacks: Tips and Tools for Observing the Night Sky by Robert Thompson and Barbara Fritchman Thompson isn't so much an end-to-end equipment tutorial as much as it is a set of tips about astronomy equipment and observing techniques. But added up, these tips and tools provide a pretty substantial introduction to astronomy equipment. Okay you have a telescope. What now? You need a guidebook that will show you what you can see. There are lots of books to choose from. Here are some of the best. Turn Left at Orion: A Hundred Night Sky Objects to See in a Small Telescope - and How to Find Them by Guy Consolmagno and Dan M. Davis. The quintessential beginner's book. NightWatch: A Practical Guide to Viewing the Universe, by Terence Dickinson. The other quintessential beginner's book. Star Watch: The Amateur Astronomer's Guide to Finding, Observing, and Learning About over 125 Celestial Objects by Philip S. Harrington is a companion volume to Star Ware (listed above). This book will teach you how to use your telescope and how to find things to look at with it. Backyard Astronomy: Your Guide to Starhopping and Exploring the Universe by Alan Dyer, et. al. A non-threatening introduction to basic astronomy (what you can see and a little of the science), an introduction to astronomy equipment, and some maps to help you get started. This is a good all-in-one package, but you might find yourself looking for additional books once you get further along. Star-Hopping for Backyard Astronomers by Alan M. MacRobert. This book opens with directions for how to use your telescope and star maps. The bulk of the book is a set of guided self-tours to take with your telescope, for each month of the year. This book is recommended for its clear and simple instructions. Star-Hopping: Your Visa to Viewing the Universe, by Robert A. Garfinkle. Very much in the same vein as MacRobert's book. This book distinguishes itself by telling you about the science behind the objects as you observe them. Celestial Sampler: 60 Small-Scope Tours for Starlit Nights, by Sue French. Like Garfinkle and MacRobert's books, here's another book of guided self-tours to take at the telescope. This one distinguishes itself by its eclectic selection of celestial objects, as well as its focus on owners of smaller telescopes. Touring the Universe with Binoculars by Philip S. Harrington is a classic observing guide that shows you the vast array of celestial objects you can observe with binoculars. Binocular Highlights: 99 Celestial Sights for Binocular Users by Gary Seronik is not nearly as comprehensive as Harrington's book, but is a friendly way to get started with the best objects to view through binoculars. An astronomy guidebook will tell you what you can see, but it's also helpful to have a good star atlas to find those objects. That's true even if you have a computerized telescope. Here's some basic star atlases that will not only get you started, but carry you far into the hobby. Sky and Telescope's Pocket Sky Atlas by Roger W. Sinnott. This atlas has become the preferred star atlas for many experienced astronomers, because it was made by observers for observers. It's small and spiral-bound so it's easy to use at the eyepiece, the map layouts make sure nothing gets cut off at the edges, the design and typography make symbols and labels easy to see, and it still manages to incorporate enough celestial objects to satisfy even advanced observers. All this and yet it remains accessible to beginners. Plus, it's less than $15 at Amazon. A true winner. The Cambridge Star Atlas, by Wil Tirion. Another excellent star atlas, this book has a series of 20 charts that cover the entire sky, displaying stars down to magnitude 6.5 (all stars that can be seen with the naked eye). 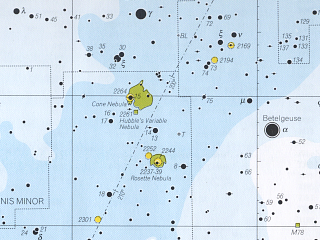 It is not as detailed as the Sky and Telescope atlas, but it plots a great deal of deep-sky objects, and each map has an accompanying page listing the objects and providing information on them. It's beautiful, compact, and well-laid out. This atlas should be sufficient to get you through the bulk of the Messier Objects, and then some. Atlas of the Moon, by Antonin Rukl and Gary Seronik. Moon observers hail this book as the finest lunar observation atlas by an overwhelming margin. When it was out of print for a few years, used copies sold on eBay for up to $600. If you buy only one book to help you observe the Moon, this is it. The second Moon book you should buy is The Modern Moon, a Personal View by Charles Wood. Written by a lunar scientist, but for amateur astronomers, this is the finest book available to explain the science behind the views of the Moon in your telescope. These two books go together like peanut butter and jelly, and at one time they were available as a boxed set. Finally, Sky & Telescope's Field Map of the Moon is a foldable map version of Rukl's atlas that is designed for use at the eyepiece. Like the Sky and Telescope Pocket Atlas, it was made by observers for observers. Finally, do you want to know about the science of astronomy - stars, planets, galaxies, how they formed and how they work? You probably want a beginner's astronomy textbook, the kind used to teach astronomy classes. They're all about the same, and I don't have a lot of experience with them, so I'll direct you to this list of astronomy textbooks on Amazon by Norm Sperling, an astronomy educator, book collector and astronomy textbook aficionado. (I own an older copy of Astronomy Today by Chaisson and McMillan, but really any of the books in this category will do). I can give you one tip for purchasing astronomy textbooks. The most recent edition of any astronomy textbook is always very costly - usually $100 or more. But if you look through used book dealers online for the previous edition, or perhaps two editions back, you can find the same textbook used for a lot less money, often less than $10. I wouldn't go too far back, because astronomy is a fast-moving science, and even textbooks 10 years old are hugely out of date.